This page will show you step-by-step guide to reallocate disk space on Windows Server 2003 64 bit by using partition software. Download IM-Magic Partition Resizer Server when need to resize hard disk on Windows Server 2003 64 bit. It is safe and secure. Windows 2003 64 bit system is widely used by many people, and most of them have such a doubt if they always need to repartition hard disk when disk partition is running out of disk space. In fact, there is no need to repartition hard disk. Only a partition management software can help resolve the problem. IM-Magic Partition Resizer Server is professional partition software, which can resize hard disk by moving free space from one partition to another without touching original data. This partition software is easy to handle and 100% safe to use. It can work on all Windows Servers. You need to move the unallocated space close to the partition that is running out of disk space. 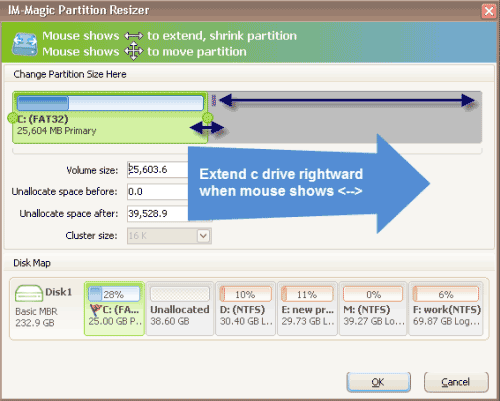 Right click this partition and choose "Resizes/Move" option. "There are three partitions on my computer which runs under Windows Server 2003 64 bit operating system. 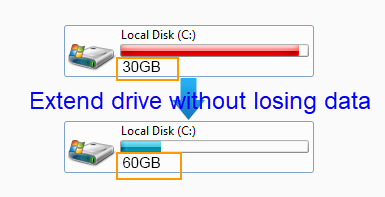 Now, the system partition C drive is getting full and system frequently says low disk space warning. Only E drive has some free space, so I want to move some free space from E drive to C drive. Can you recommend any partition software which can extend the C drive on Windows Server 2003 by moving free space from another partition?" "The C drive is running on low disk space in Windows Server 2003 VMware. I tried to delete some unnecessary files from C drive, but it only free little space. I am wondering if I need to reinstall the VMware machine to reallocate disk space to fix the low disk space on Server 2003, but I do not have any storage media to backup data on the VMware disk before reinstalling the machine. What should I do?" System partition refers to the partition on which operating system is installed, so it is also called OS partition. When system partition is running out of disk space, problem cannot be resolved easily by deleting or moving unnecessary files. Only professional partition software can resolve the problem thoroughly. The IM-Magic Partition Resizer Server has the ability to resize system partition without reinstalling system or having any influence on the OS. By using this partition software, you can extend size of system partition with original data untouched. When a data volume is running out of disk space on Windows Server 64 bit, you can delete data to free up space. If the data stored on the partition is important, you can move it to another partition or any other storage media like an external hard disk. However, you should be careful when transferring the data to avoid unexpected data loss. Now, with IM-Magic Partition Resizer Server, you can increase the size of a data volume without deleting or moving any data. This partition software allows you to add free space to the data volume from another data volume or C drive system partition. You can run Diskpart command to extend disk partition under Windows Server 2003 64 bit, but it has some limitations. Simply say, Diskpart only allows you to extend a data partition that has NTFS file system. If you need to extend system partition or FAT32 partition, Diskpart command is not available. In addition, you had better backup important data before running Diskpart to extend a partition. If you are a Windows Server 2003 32 bit user that runs into low disk space problem, you can also use the IM-Magic Partition Resizer Server. This partition software can work on Windows 2003 32 bit and 64 bit to resize hard disk. You can increase size of disk partition without reformatting disk or rebooting your computer. Simply say, if you are still wonderring how to resize partitions of Windows Server 2003, you can free download the partition software and follow the guide step by step.